WELCOME TO MY MONEY MISSION ONLINE: MOM MINUTES JUST FOR HELENE!! MOM MINUTES JUST FOR HELENE!! So, blog friends, even though I don't drink, I raise my invisible glass to you and offer a toast! It's been a rough week (think SonyaAnn's blog and Helene's job!) and I want Friday to start early! HA! Thank you so much for helping me though my funk! I really love you. In a good way and not naughty! And I hope you don't mind I'm going to cut and paste that saying and print it for Thanksgiving. This was worth reading..I needed a lift today. LOL! 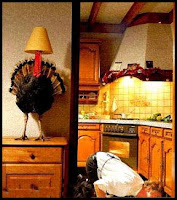 I think we all need a Thanksgiving like that!